…well, almost all vegan! this week chili addiction rolled out a brand new “vegan menu,” although there are a couple clearly marked real-dairy-vegetarian items on it including mac n cheese and cornbread muffins. other than that though, it looks epic! 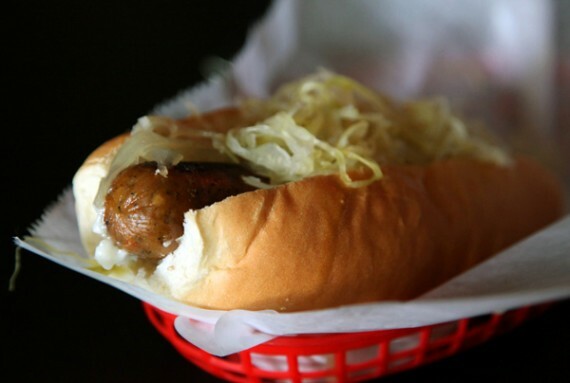 the lists of vegan dogs, burgers, and sausages are HUGE compared to what they used to be! a few of the new vegan items include the quarrygirl burger (pictured above) which was a previous special, the buffalo wing dog, and the jalapeno magic sausage. i can’t wait to go try all this stuff. check the new menu here. OMG! new quarrygirl burger at chili addicition! i couldn’t even believe it when i went to chili addiction recently and saw they had a new menu item named after ME. 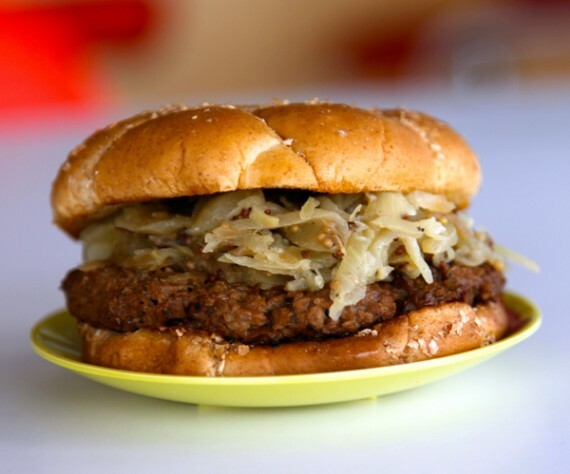 the quarrygirl burger combines two of my favorite dishes—the hearty match-based burger and johnny’s insane homemade sauerkraut. of course, i had to order it! i think these nachos are the best, because they come with everything i love: daiya cheese, bean chili, salsa, avocado, soy sour cream, and jalapenos all on top of crispy chips. super good and SUPER cheap at under 5 bucks! 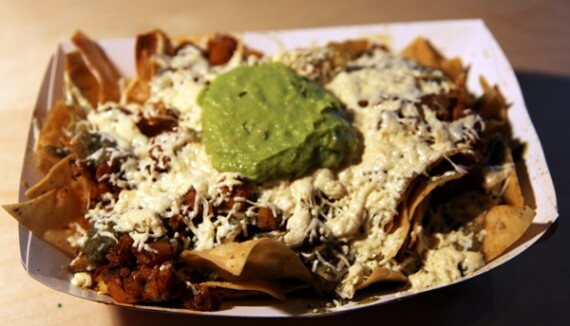 the not-chos at real food daily are BY FAR the best thing on the menu, and i have to order them every time i go. tortilla chips topped with the best homemade cashew cheese i’ve ever tasted, along with black beans, pico de gallo, guacamole, and tofu sour cream. you can add taco mix for an extra $2.75…but with an $11.75 base price, i think these nachos are expensive enough. pro tip: if you like spicy food, be sure to ask for the jalapeno cashew cheese! 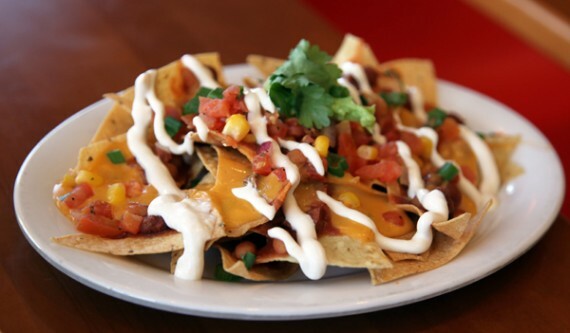 hugo’s tacos sells “normal” nachos, but if you request them with a vegetable filling and daiya cheese, they are instantly vegan. they use the italian blend daiya rather than cheddar, which may sound a little bit odd, but it’s surprisingly good! i get mine with the soyrizo, potato, and zucchini filling; along with the jalapeno hot sauce! the serving size is absolutely massive (enough for 2 people to share), yet only costs $5.92. 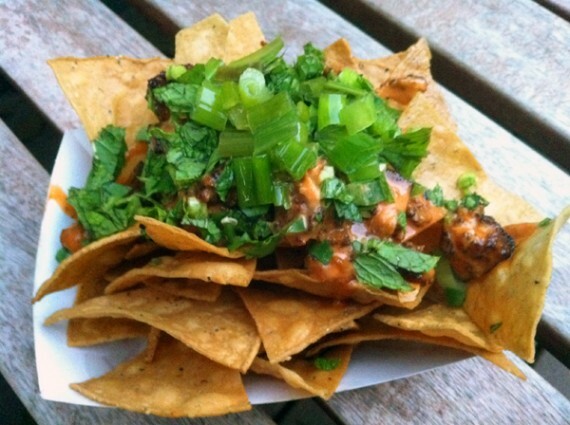 what makes these nachos stand out are chili addiction’s phenomenal homemade chips and chili. the chips just taste incredibly fresh, and the chili is by far the best in town. 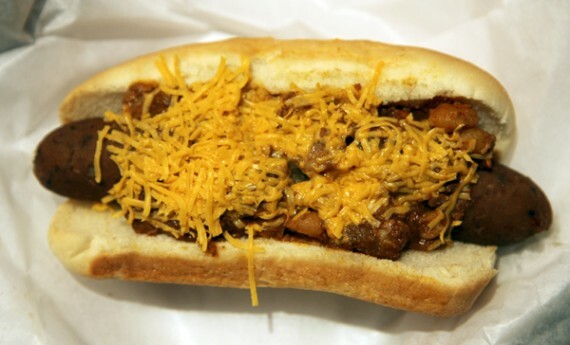 you get a huge portion of those, plus a layer of daiya cheese, diced jalapenos, and onions for $8. if they would just melt the daiya a little, these things would be PERFECT. 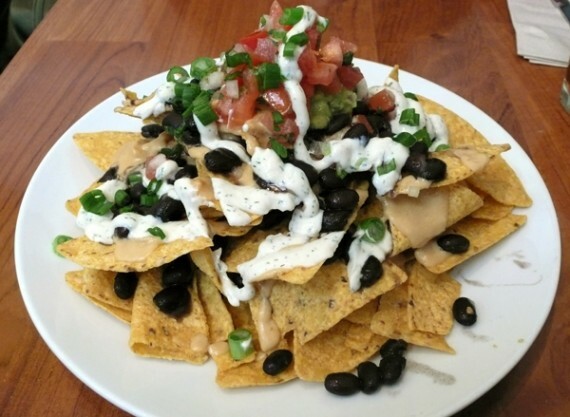 a fresh take on vegan nachos, these don’t have any kind of fake cheese on them, but instead are covered with a creamy sriacha aioli. they also come with a healthy amount of mandoline’s amazing lemongrass fried tofu, scallions, mint, cilantro, and jalapeno. and at just $4.50, they’re an excellent value! these are definitely at the top of my list of foods i need to try. with both homemade chips and cheese, i bet they are spectacular! 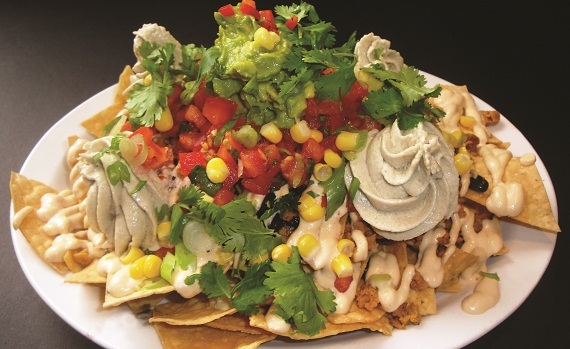 so let’s all go eat some vegan nachos tonight, and show everyone that the international day of the nacho doesn’t need to include meat or dairy. weeee! Okay, so we’ve already posted about the best vegan and best vegetarian restaurants in Los Angeles, but sometimes we vegans HAVE to eat in omnivorous restaurants. That’s a part of life. 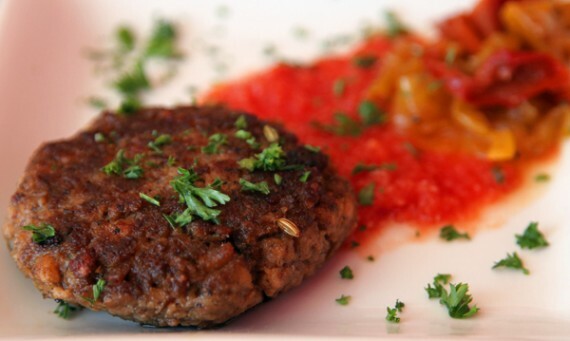 What’s interesting, though, is when we find meat-serving restaurants that we WANT to eat in. That’s a whole different story, and LA has a few outstanding omnivorous establishments that go out of their way to cater to vegans. Here are our favorites, updated from last year’s list. The first time I heard about Tony’s Darts Away, I thought somebody was messing with me. I mean, a craft beer bar with an over 50% vegan menu? C’mon, people, who are you kidding? When I stepped into Tony’s on the night it opened I had to pinch myself a few times to make sure I was awake and not dreaming. First off there was a HUGE selection of California craft beers, including many of my favorites and some that I’m very glad to have discovered. Next up, there’s a menu with a ton of awesome vegan offerings including a build-your-own vegan dog with three different sausage flavors. Seriously, what better way to wash down some awesome vegan food than with an equally awesome craft beer? Tony’s Darts Away is one of the best places to open in Los Angeles in years. 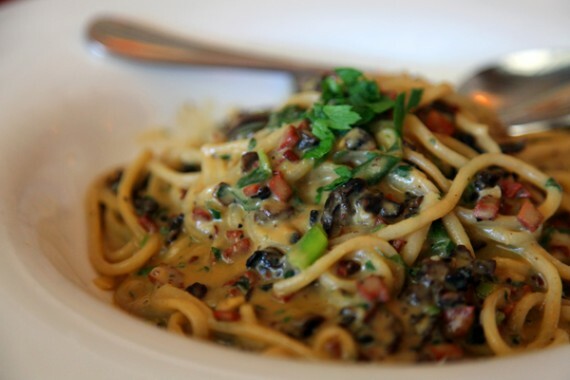 Vegans, omnivores and everything in between should not hesitate to check it out. 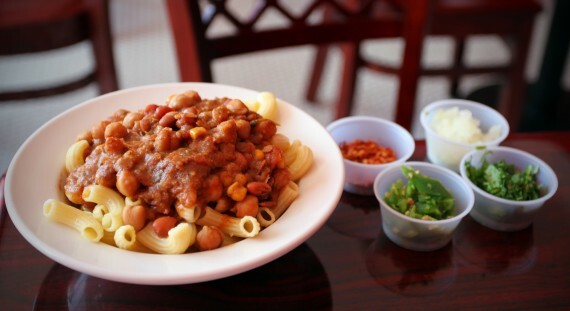 Although firmly omnivorous with its menu items, Chili Addiction is a vegan’s delight in every way. At any given time there will be at least two vegan chili dishes available, and the selection of vegan dogs, burgers, sorbets, fries and plain ol’ chili is to die for. This is one of those places where everything on the menu is so good that you have real trouble deciding what to order. I usually go for an order of Chili Mac, and a dog or burger sometimes with a side of chili fries to share, and everything I’ve ever had has been top notch. In fact, I think Chef Johnny, co-owner and genius behind the award-winning dishes at Chili Addiction, could be one of the most talented and under-rated chefs working in LA right now. If he’s in the counter-service restaurant when you visit, he’ll happily give you a taste of anything on the menu as well as run you through the ingredients and even explain the concept behind the dish. On a recent visit I enjoyed some amazing hominy chili while Chef Johnny explained how he had come up with the recipe and how he was challenged to get the hominy texture “just right”. On another occasion, I enjoyed the best vegan sorbet of my life, and Chef Johnny took delight in telling me about a special machine he had obtained to make it! Chili Addiction has parking out back, and is only steps from the Beverly Center in West Hollywood so there’s really no excuse to go there and eat. Just do it, you won’t be sorry. it’s no secret that we love pizza here on this blog. I mean, who doesn’t? There would have to be something wrong with anybody that didn’t love a perfect crust, tangy sauce, fresh toppings and a yummy vegan cheese, right? Well, assuming that you’re on the same page as the above, you need to get over to Pizza Cookery in Woodland Hills ASAP. Unceremoniously accessed through a side entrance of a somewhat decrepit 70s-era shopping mall awaits some of the best vegan pizza you can get, as well as an environment and ambiance that feels more like Old Chicago or New York than deep in the 818. A combination of funky retro styling (old cast iron soda vending machines) and sawdust on the floor along with faux-gas lamps everywhere really evoke an intimate atmosphere that’s as suitable for a first date as it is an office party. The menu is hugely vegan-friendly with a selection of salads and breads most of which can be made vegan. Everything is stunningly fresh and very well prepared, from the vegan caesar salad to the amazingly tasty and filling cheesy rolls. The pizza crust is soft and chewy, while the brick oven takes care of nicely charring the bottom. All the toppings were bright and colorful and the sauce and Daiya cheese mixed perfectly together. 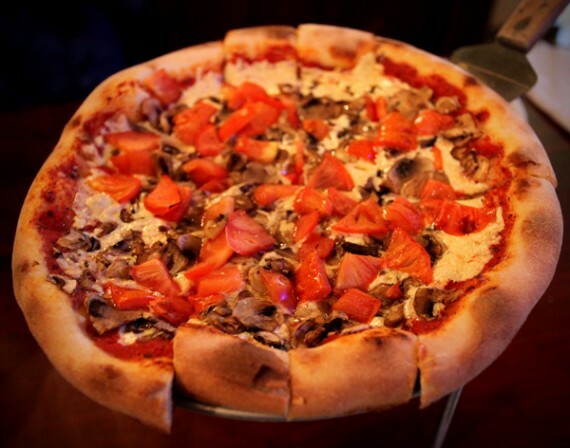 Pizza cookery is the best pizza place in LA that serves vegan pizza and is dine-in. You’ll feel like you’re in a real pizza parlor of yesteryear, and leave very full and very satisfied. With a totally vegan menu except for fish, M Cafe has a chic urban appeal, backed up with an A-list of ingredients (and clientele) all layered over an efficient kitchen and fair pricing, considering how great the food is. While the last year or two M Cafe’s items have been prepared by kitchen staff rather than chefs, their menu items are still some of the best in town. The Big Macro is arguably LA’s best vegan burger. 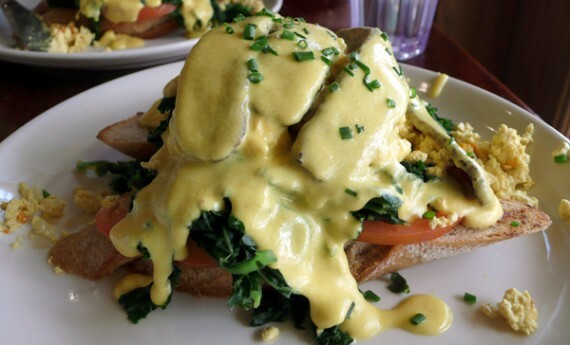 The broccolini pepporochini is without a doubt LA’s premier broccolini, and the Vegan Benedict is constantly voted one of the “best” breakfast items on any local menu. There are plenty of vegan options at all times of the day, and the rotating menu constantly keeps one coming back for more. The deserts are out of this world, along with some of the best vegan tiramisu known to humanity. Check it out!! With two locations (West Hollywood and Studio City), and a full-on meat-oriented menu, one might be surprised to find that the Hugo’s chefs have created some seriously innovative vegan cuisine. Not only do they have loads of options, but the menu has several clearly marked animal-free alternatives, as well as dishes that can be optionally veganized. If you can get past the trendy atmosphere, long waits and constant celebrity sightings you’re in for a vegan treat. 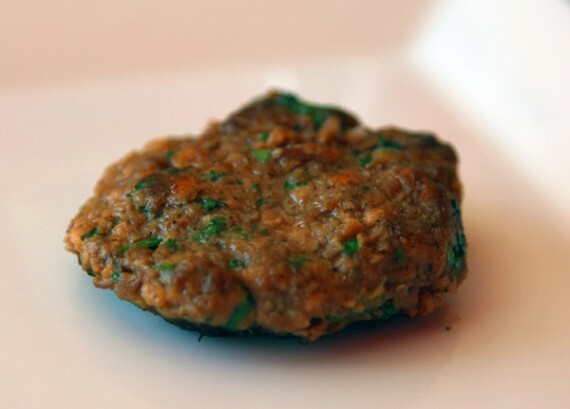 Although I’ve long been a fan of the tofu scramble, I also love the Very Green Casserole (one of the best vegan burgers I’ve ever tasted atop stewed vegetables and sauce in a pot) as well as the salads, tikka masala veggie patties, stir-frys and wraps. Make sure you specify “VEGAN” clearly when you order, while the restaurant is extremely vegan-friendly, there may be butter hiding in unsuspecting dishes. Since the last time we voted Hugo’s onto this list, they’ve introduced some astounding vegan specials that rotate in and out, and usually stay on the menu for a week or two before being replaced with something new. This is a very welcome addition, and the specials have been some of the best vegan dishes we’ve eaten anywhere. killer sorbet and new vegan sausages at chili addiction! hi folks, just a quick post to tell you about some fantastic current and upcoming chili addiction menu items that you should all be aware of. i’ll start with the food that is actually available right now: vegan sorbet! 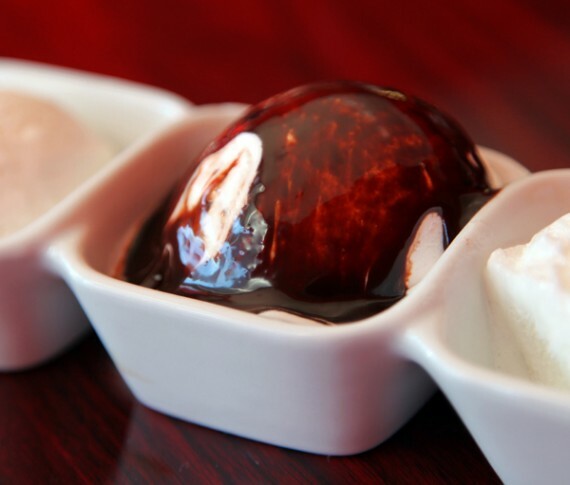 did you even know that chili addiction offered dessert?!? i didn’t until my last visit, and now i am gonna be HOOKED. this stuff is so good, and just perfect for the hot weather. after stuffing myself with various kinds of vegan sausages (more on that later), the chili addiction dudes offered me a sampling of 3 of their sorbet flavors—lemon, lime, and banana. i am usually not a sorbet fan, but this was incredible. most sorbets i’ve tried in the past have been thick and icy, but not this. it was extra smooth and silky, with an almost milky texture, like real ice cream. i asked what made it so creamy, and johnny (the chef wizard at chili addiction) explained that he has a special contraption that helps the fruit reach that magical texture. not only is it delicious, but it’s relatively guilt-free as well. made from only fruit and sugar, this treat has no excess fat or scary ingredients—just pure, natural goodness. the bratwurst was amazing. 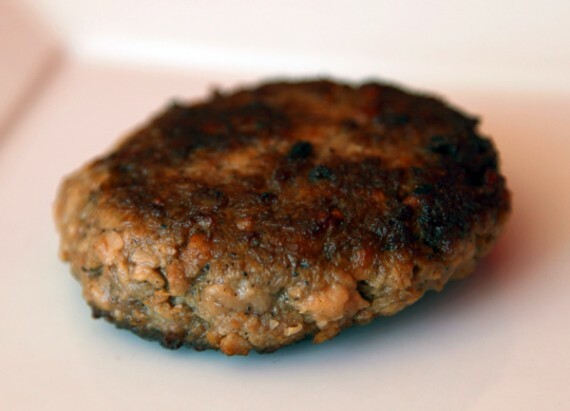 as a burger, i loved it…but i can’t wait to try it as a sausage with some sauerkraut as a topping. as much as i love all the pre-made veggie dogs and sausages on the market, this has got it beat. the cilantro sausage was quite delicious as well. i myself am a coriander lover, so this was right up my street. next up was the chipotle sausage, the perfect blend of match and hot spices. i loved this thing so much; and it was served with a fantastic side of homemade salsa. 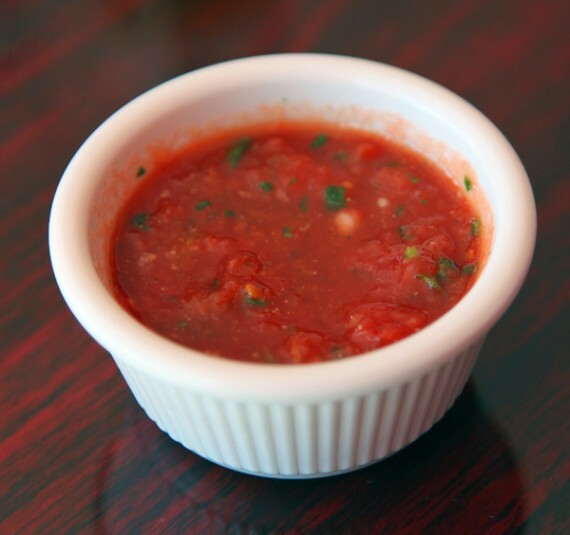 i didn’t even know chili addiction carried salsa, but i am gonna ask for this as a side from now on. honestly, this can hold its own with the freshest of stuff from real mexican restaurants. it’s that damn good. and the sausage ruled too. then came the vegan italian sausage, and it took everything to a whole new level. this baby was all loaded up with seasoning and fennel, the closest thing i’ve tasted to proper meat ball since going vegan. i really wanna try this in some pasta, or maybe atop a bowl of chili mac. lastly, we tried the new vegan breakfast sausage…and i’m not gonna lie, this was my favorite one. decades ago when i was a wee meat-eating quarrygirl, i remember visiting my aunt in tennessee, and every morning she’d cook up batch after batch of her “extra special” sausage. of course it was all full of animals and gross stuff, but i really loved it at the time. suffice to say, one bite of this creation, and i was transported to those childhood memories in the deep south. authentic-tasting beyond belief. i can’t wait to see what chili addiction decides to do with this, but i sure hope it’s some kind of breakfast sandwich. sorry to tease you all with these mouthwatering sausages that aren’t available yet, but look out for them at chili addiction soon! the sorbet is on the menu now, though. 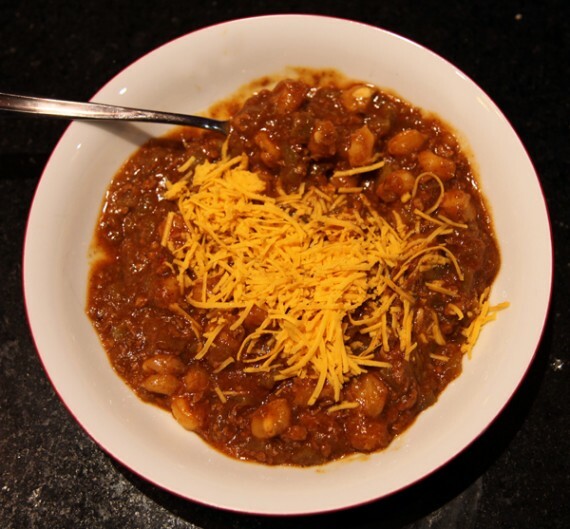 so go and eat that up with all of the other amazing dishes chili addiction has to offer! 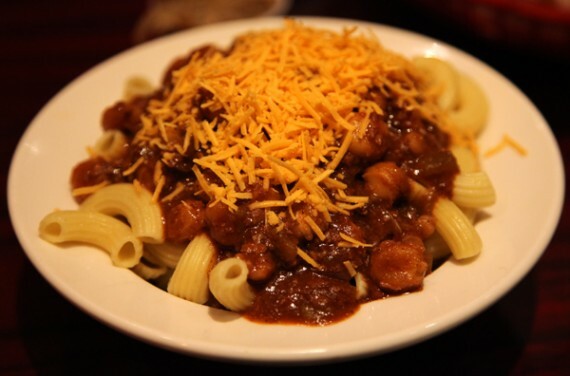 okay, so i know i have raved, and raved, and raved about the burgers, sausages, and fried delicacies from chili addiction…but lately i am straight up obsessed with their bowl of chili mac. this thing is SO FREAKING GOOD, it makes me wanna re-write the vegan bucket list just so i can add it. 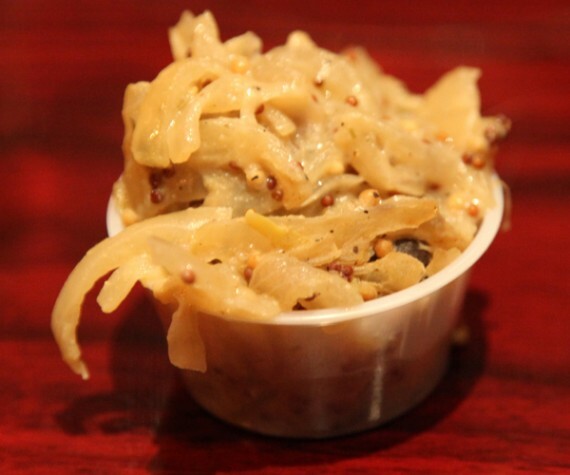 the chili mac is simple: you pick any of the restaurant’s amazing chilies to top off a hearty bowl of elbow macaroni. there are usually 2 vegan options to choose from, and lately i can’t get enough the 3 bean euphoria…a mix of garbanzo, pinto, and black beans. if you are craving meatiness, chili addiction also always has an amazing option containing match (the most convincing vegan meat EVER). i know a serving of chili spooned onto a bowl of noodles may sound like something you can make at home, but i can assure you that it isn’t. chili addiction puts so much time and effort into each of their chilies, i swear it’s like nothing you’ve ever eaten. this stuff tastes like it has been cooking for days, with unique flavors and spices buried deep in every bite. i can’t even describe how good this chili is, you just need to go experience it for yourself. as if the bowl alone isn’t awesome enough, chili addiction also has a self serve condiment bar with limitless jalapenos, onions, and cilantro. you seriously gotta try this meal out—i’m drooling just thinking about it. 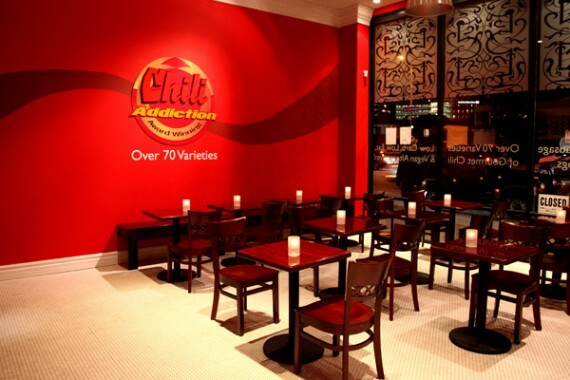 chili addiction in west hollywood doesn’t get nearly as much ink on this blog as it should. the place is seriously a godsend for vegans and has some of the the best animal-free chili, burgers, and sausages you will ever eat. 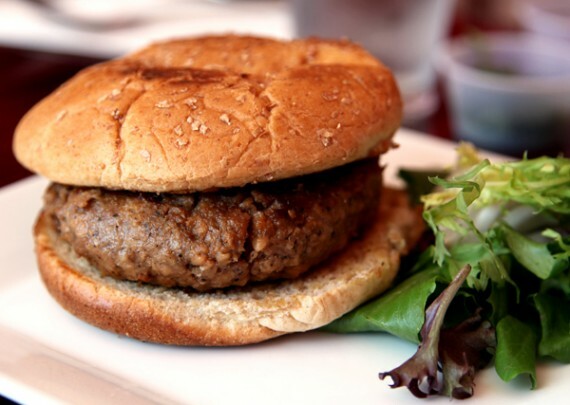 VEGAN BURGERS and more!!! now available at chili addiction! 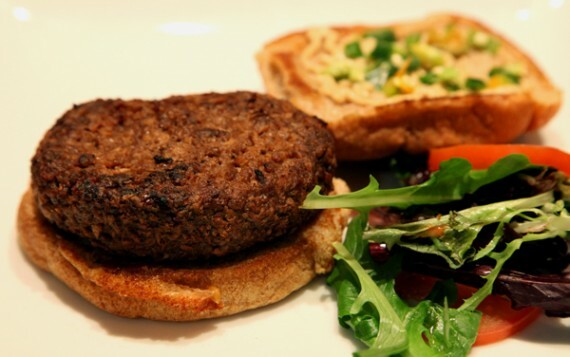 remember those match vegan burgers we raved about recently?! well they are finally available at chili addiction as of TODAY! i can’t stress to you enough, these really are the HEARTIEST and MOST REALISTIC veggie burgs i’ve ever tasted. not just that, but they’ve also started making a new “texas style chili” with pinto beans and match beef as well as a vegan sorbet with fresh strawberries! GO GET IT. since chili addiction opened, they’ve been getting more and more vegan-friendly and have been experimenting with tons of new products. 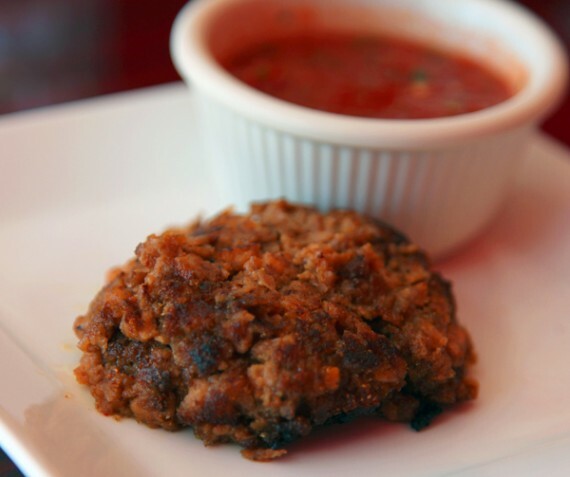 it started with the simple addition of daiya cheese and field roast sausage, then they went and created an entire vegan menu, and now they are testing out what i think is the most realistic fake meat ever, match. new vegan menu at chili addiction! about a month ago, we wrote a post about the very awesome and vegan-friendly restaurant, chili addiction. well since then, they’ve expanded their animal-free offerings, and now even have a separate vegan menu! last week, i hit up chili addiction with brittany from sick of lettuce to check out the new menu, and the food did not disappoint! since i’d already tried the vegan chili cheese sausage (which is amazing), we went with all new stuff and ordered the chili mac and chili addiction nachos. we got the chili mac (pictured above) with soyrizo hominy chili and daiya cheese, and it was absolutely incredible. i’ve never had chili on top of noodles before, but i can promise you it’s a great combo. the homemade chili was super hearty and flavorful; by far the best vegan chili i’ve had in LA. we ordered the nachos with the three bean vegan chili, and they were even better than the mac! 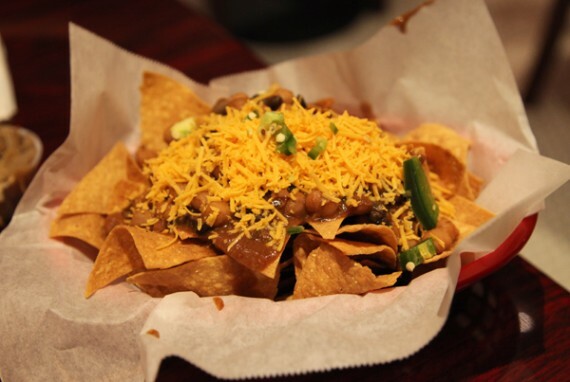 if you are a fan of vegan nachos, chili addiction is your place, because they make both the chips and chili from scratch. these babies came smothered with tons of chili, daiya vegan cheese, jalapenos and onions. plus, the restaurant has a toppings bar where you can add more onions, jalapenos, and fresh cilantro. we also ordered a side of the sauerkraut, which was mind-blowingly tasty. like everything at chili addiction, this stuff was completely homemade and perfectly spiced. my only complaint is that i wanted more! 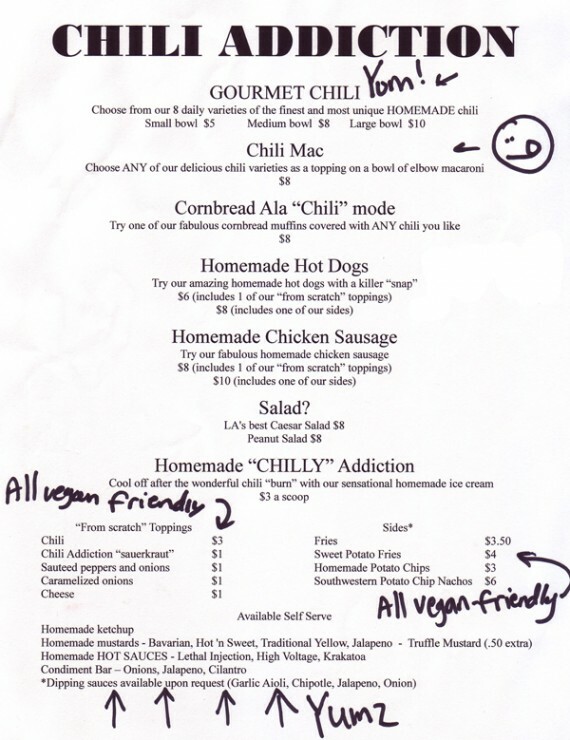 so head on over to chili addiction as soon as you can and check out their new vegan menu. 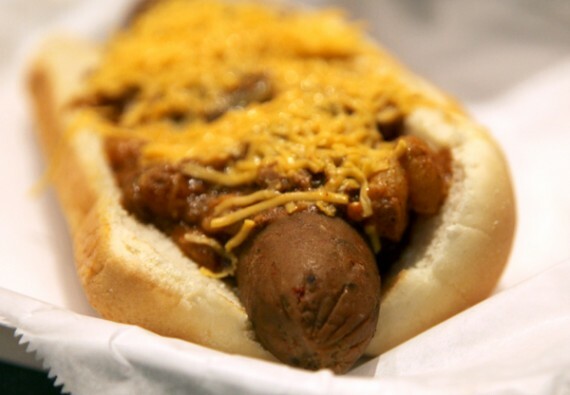 they’ve got chili dogs, nachos, and a whole slew of side dishes that you are sure to love. 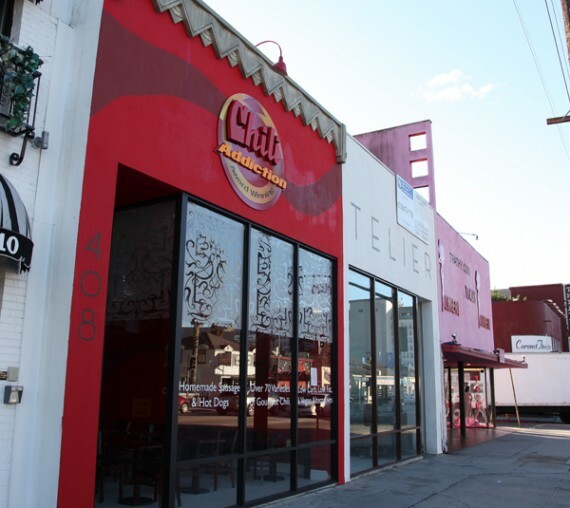 vegans, there has never been a better day than this to head over to weho and try out chili addiction. the brand new restaurant opened up last week and when i dropped by last night, they not only had their standard vegan chili offerings, but were also testing out soy hot dogs, vegan sausages, and daiya cheese. Hom-onious Chorizo: First you take some Soy Chorizo, then you add some Hominy, cook it with Johnny's secret blend of spices and...Presto..a perfectly harmonized, savory, and full textured 100% VEGAN CHILI! i started with an order of what i came for, the vegan “hom-onious chorizo chili”. i read about it on chili addiction’s website and immediately knew i had to get it. i am a huge fan of hominy, so the thought of adding it to soy meat and chili addiction’s secret spices sounded absolutely delicious. 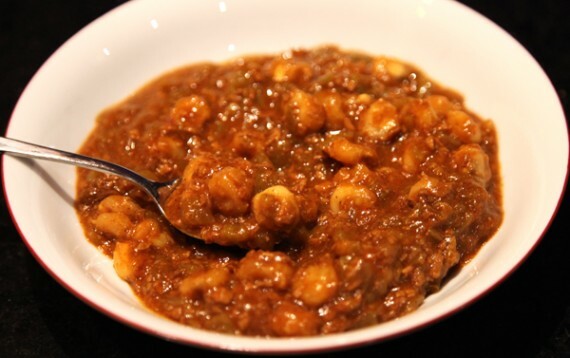 the result was a hearty and full-bodied homemade chili mix that was incredibly flavorful and incredibly filling. they even gave me a side of daiya cheddar which complimented it perfectly. this is the second time i’ve eaten the vegan chili from chili addiction, and i must say i am smitten. it’s so much better than the stuff you find sold in a can, or than anything i could make at home. hominy mixed in with soy chorizo really is as good as it sounds. i also got a vegan chili cheese sausage to go, which was super awesome. it came with a field roast sausage (my favorite kind) smothered in the same incredible hominy soyrizo chili and topped with daiya cheddar. they should still have the sausages, cheese, and dogs in stock today…so get over there and order some. i’m pretty sure this is the first time in my life i’ve ever had a vegan chili cheese dog, and it was sooooo good. let’s go buy these today and encourage chili addiction to offer these options regularly. and if they run out of sausages or cheese before you get there, there are plenty more drool-worthy items on the menu. they usually have two vegan chilis in stock (one soy and one non-soy), which you can add to all kinds of delicious things. you can have chili mac, chili fries, chili sweet potato fries, or chili potato chip nachos. not to mention their homemade sauerkraut which i tasted and LOVED. and everything at chili addiction is high quality and made completely from scratch—from the chili itself right down to the condiments and potato chips. so head on over to chili addiction today and try out some of their new vegan items. 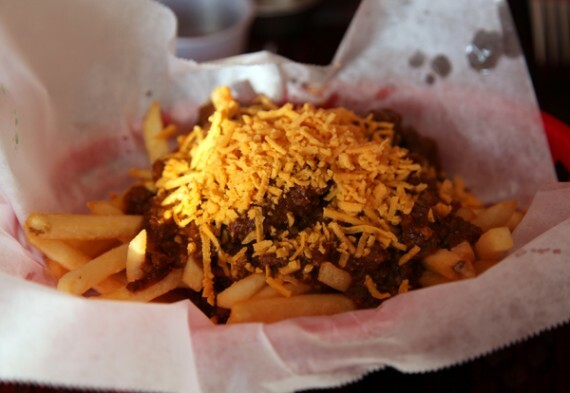 vegan chili cheese fries sound like a lunch plan to me…. chili addiction set to open this week! great news, vegans! the long-awaited and vegan-friendly chili addiction is finally opening to the public at noon this friday. not just that, but one of their newsletter subscribers told me they are also set to have a soft opening sometime this evening (call them for more info). the hollywood farmers market is a vegan mecca. 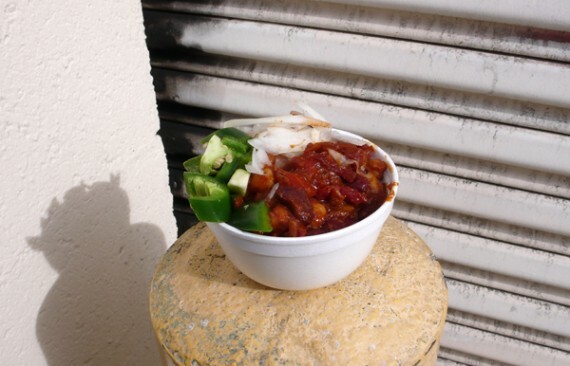 of course we know about the amazing animal-free vendors like a taste of life (best breakfast sandwich ever) and c’est la v (killer cupcakes), but even the meat-peddling vendors like chili addiction have options to please us! 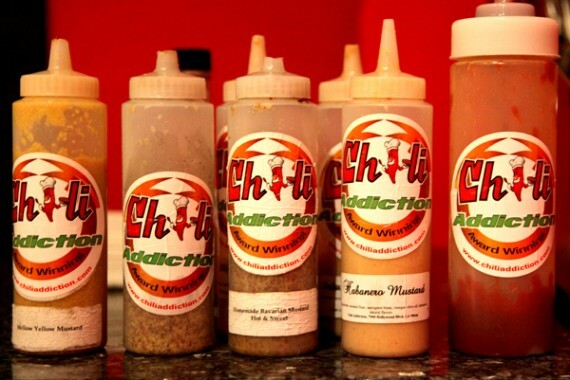 i never thought a stand called chili addiction would be so damn vegan-friendly, but when i read a glowing blog review of their meatless options, i was inspired to check them out. sure enough, i hit them up at the farmers market and was blown away by their vegan chili! they are at the hfm every sunday, right next to the c’est la v stand on cosmo street, and offer at least one vegan selection each week. when i visited, they had a vegan bean chili on special that consisted of garbanzo, pinto and black beans. plus, they had a self-serve bar (if you can call it that—it was tiny!) of chopped onions and fresh jalapenos. so delish. bonus points to any restaurant or food stand that grants me unlimited access to jalapenos. just sayin. the homemade chili was amazing, oozing with full-bodied flavor and perfect seasoning. my only gripe would be that it was kinda expensive. a tiny bowl for $6.50?! just seems a bit steep. in typical farmers market fashion, this chili was enjoyed quickly, while standing. as you can see above, a bollard became a makeshift table for our meal. soon though, i will be able to relax and eat me some chili addiction whilst sitting at a proper table inside a permanent building. they are opening up a restaurant on la cienega within the next coupla weeks, and will be serving at least two vegan chilis at all times! i can’t wait.